Fudge for Your Child ? Yup! - Energetic Juniors - Contact Us! Fudge for Your Child ? Yup! Fat seems to be trending recently, so it has been on my mind a lot. Most of my clients feel better and get less sugar cravings and mood swings, when they start incorporating more fat into their diets. Most snacks that kids enjoy, tend to be high in processed sugars and simple carbohydrates (hello Welch’s Fruit Snacks) which can cause a slump 1-2 hours after eating them. 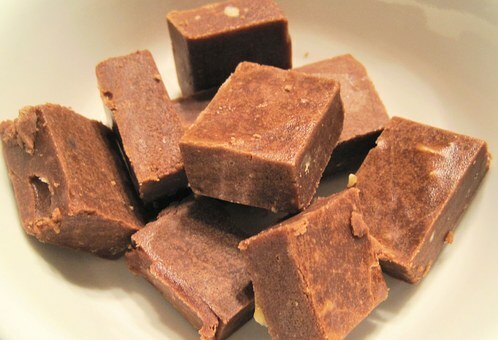 I love this fudge recipe since it is an easy to make with the kids, and not to mention, delicious! Adapted from The Minimalist baker. Line a standard 9×5-inch loaf pan with parchment paper. Set aside. To a food processor, add shredded coconut and blend on high until a creamy butter is formed – about 4 minutes. Scrape down sides as needed. Transfer mixture to lined loaf pan and spread into an even layer. You can add crushed peanuts or coconut flakes on top, but I chose not to. Freeze until firm – about 15 minutes. Then use a hot knife to slice into even squares – about 21. Enjoy immediately and store leftovers in the refrigerator up to 10 days or in the freezer up to 1 month. If frozen, let soften at room temperature for 5-10 minutes for best texture/flavor.